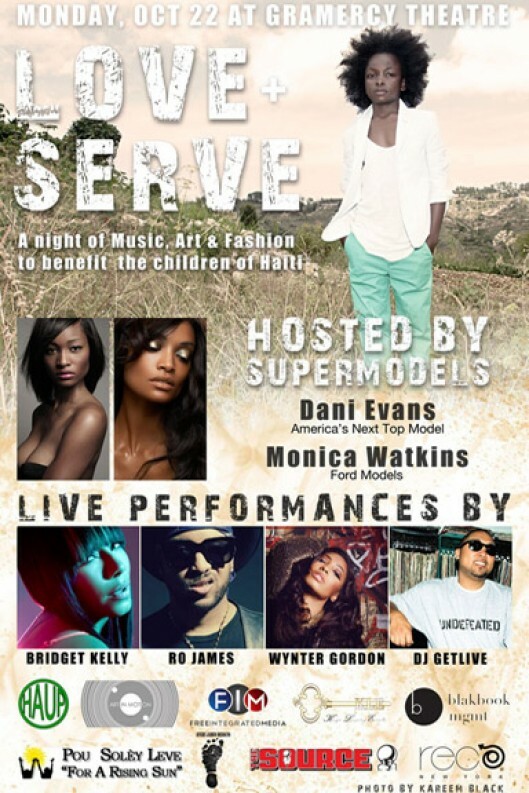 Come out to the Gramercy Theatre for LOVE + SERVE, a night of music, art & fashion to benefit the children of Haiti featuring performances by Wynter Gordon, Bridget Kelly, Ronnie James and DJ Getlive and hosted by supermodels Dani Evans (America’s Next Top Model) and Monica Watkins (Ford Models). Purchase your tickets to this fantastic concert with a cause! A portion of the proceeds will be donated to HAUP and Art in Motion. More info on both organizations is listed below the official LOVE + SERVE invite. This entry was posted on Thursday, October 11th, 2012 at 9:11 am	and is filed under Arts, Benefit, Events, Fashion, Music, Photography. You can follow any responses to this entry through the RSS 2.0 feed. You can leave a response, or trackback from your own site.